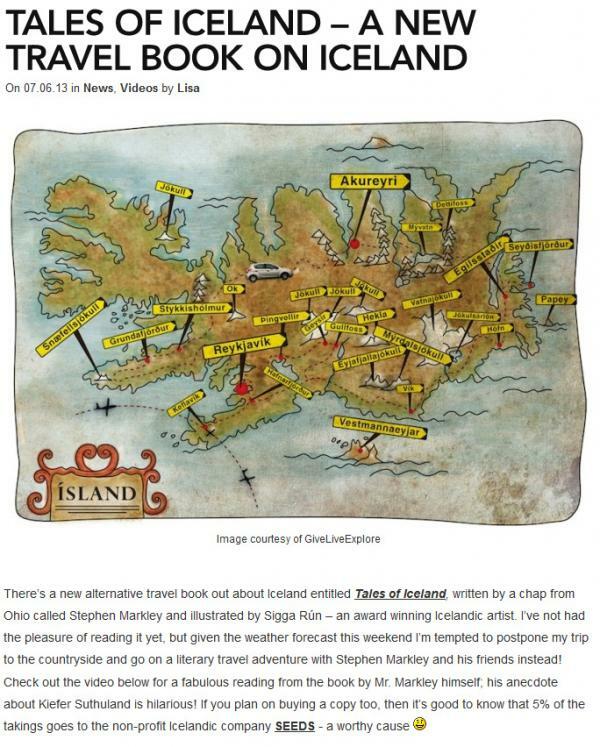 "There’s a new alternative travel book out about Iceland entitled Tales of Iceland, written by a chap from Ohio called Stephen Markley and illustrated by Sigga Rún – an award winning Icelandic artist. I’ve not had the pleasure of reading it yet, but given the weather forecast this weekend I’m tempted to postpone my trip to the countryside and go on a literary travel adventure with Stephen Markley and his friends instead! Check out the video below for a fabulous reading from the book by Mr. Markley himself; his anecdote about Kiefer Suthuland is hilarious! If you plan on buying a copy too, then it’s good to know that 5% of the takings goes to the non-profit Icelandic company SEEDS - a worthy cause "
Smellt hér til að skoða fréttina í heild sinni. Smelltu hér til að skoða myndband af Stephen Markley við upplestur á bók sinni, Tales of Iceland.